What is the difference between a coin dealer and a professional numismatic consultant, and why does it matter? A "coin dealer" may buy and sell coins, and offer little else. A numismatic professional knows all about coins and where to find them or who to sell them to. Customers benefit from this level of experience and expertise. What distinguishes Don Ketterling from someone who simply buys and sells coins? 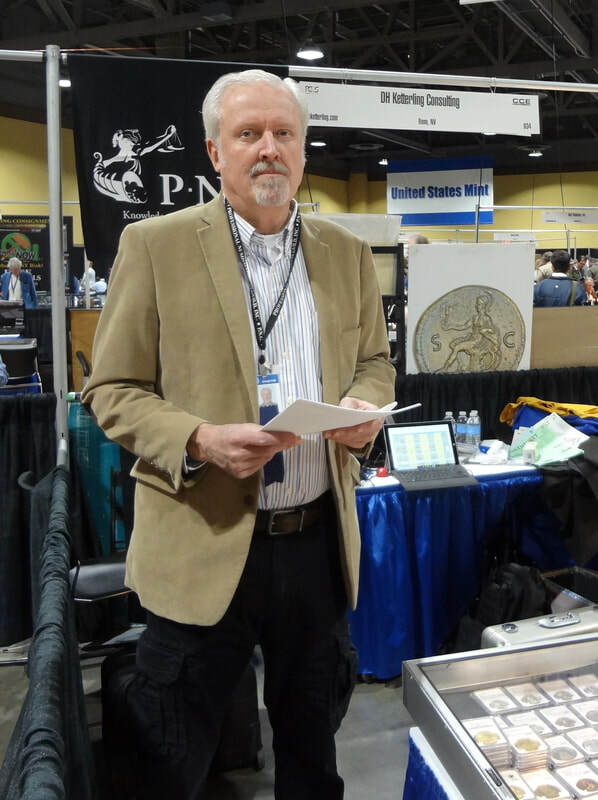 Don Ketterling is one of the most-respected professionals in the numismatic field. He has decades of experience in virtually all aspects of rare coins and currency. Don offers a wide range of services far beyond buying and selling coins. Which major coin shows does Don regularly attend? DH Ketterling Consulting regularly takes a table at the FUN, Long Beach, Central States and ANA shows. What are some of Don's credentials that set him apart? With active memberships and service on the boards of important organizations such as the Professional Numismatists Guild, American Numismatic Association and Industry Council for Tangible Assets, Don keeps his finger on the pulse of the coin hobby and related industries. How long has DH Ketterling Consulting, LLC been in business? Don opened DH Ketterling Consulting for business in 2009. His numismatic career spans nearly 50 years. Besides his election to numerous industry boards, what are some of Don's career highlights? Don has handled the single largest collection of large-size U.S. currency ever sold, most of the items listed in “100 Greatest U.S. Coins,” and many more fabulous rarities on multiple occasions. In 1987 he appraised the entire Ed Trompeter Collection, which included every proof U.S. gold coin. Why is it so important to receive a professional, unbiased appraisal of my coins and other numismatic items? If you are selling your coins (e.g. liquidating a collection) you need to know how much they are realistically worth so you do not come out on the short end of your transaction. The same holds true if you are buying - you don't want to pay more for coins than they're worth. What types of appraisals does DH Ketterling Consulting offer? DH Ketterling Consulting offers fair, accurate appraisals on coins, currency and other numismatic items. We offer Insurance appraisals and Cash Value appraisals depending on your situation. Why do many DH Ketterling Consulting customers consign their coins? The value of our extensive sources and contacts cannot be overstated. This is why many of our clients choose to consign to us rather than to sell outright. Likewise, many buyers commission us to purchase privately on their behalf because they trust that they are getting a level of expertise they can't find anywhere else. How can a DH Ketterling Consulting private, sealed-bid sale save me money? The fees auction companies charge both buyers and sellers are very high, and by listing your items in a DH Ketterling Consulting private, sealed-bid sale you can avoid those exorbitant costs and still receive top dollar for your coins. There are many more benefits; please click the link above. Why should I ask Don Ketterling's opinion before I send my coins in for grading? Don has one of the sharpest eyes and respected opinions in the business. Since 2011, he has taught advanced grading to dealers and collectors at the ANA Summer Seminars in Colorado Springs. Don can look at your coin and tell you if you should incur the expense of having it graded. Why should I go through Don Ketterling for auction representation? Auctions are extremely complicated, and their are many nuances and potential pitfalls. But when you're seeking ultra-rarities, sometimes they only come up at auction. Don's wealth of experience in all aspects of the auction process can level the playing field for his customers. Why is Don Ketterling qualified to serve as an expert witness? Don has testified in divorce proceedings, consumer class-action complaints, overpricing and misrepresentation cases, insurance fraud and robbery cases among others. His broad-based background in numismatics over many decades gives him the expertise necessary to perform with distinction. What is the best way to contact Don Ketterling? DH Ketterling Consulting is not a walk-in business. Please call 818-632-2352 or use the form on our Contact page to make an appointment with Don Ketterling.